Ronin Brand contacted me in July to do a review of their John Small’s designed 5 Borough Gi (blue A3L). Since then I’ve worn it at least 20 times, washing and drying it each time. In short, I’ve beaten it up as much as possible over the last 90 days. 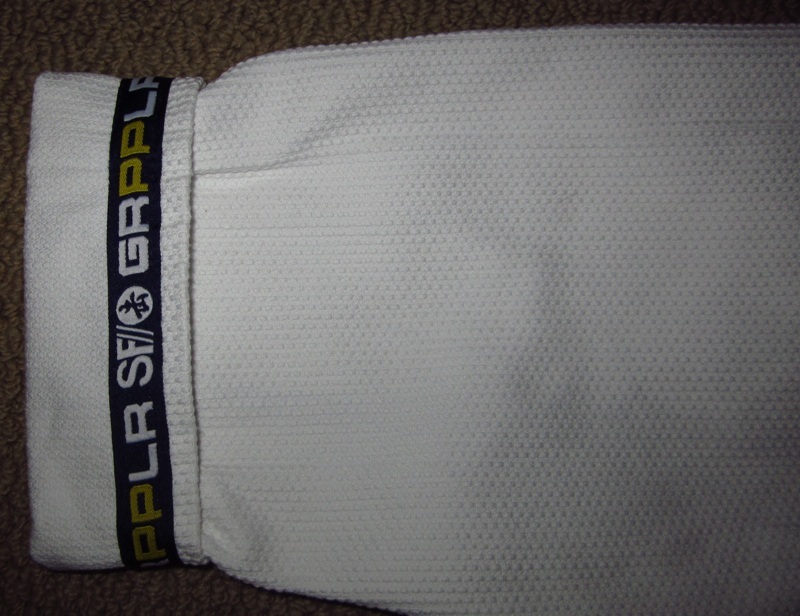 The gi is available in white, blue and black. Ronin also has sizing for long/slim folks. This limited run gi is simply designed with an illustration by John Smalls printed on the inside of the 5 Boroughs of New York, hence the name. [Editor’s Note: All pictures were taken after the gi was used for 90 days]. Johns Smalls, if you’re not familiar with him, is an avid BJJ practitioner and professional artist who lives in NYC. 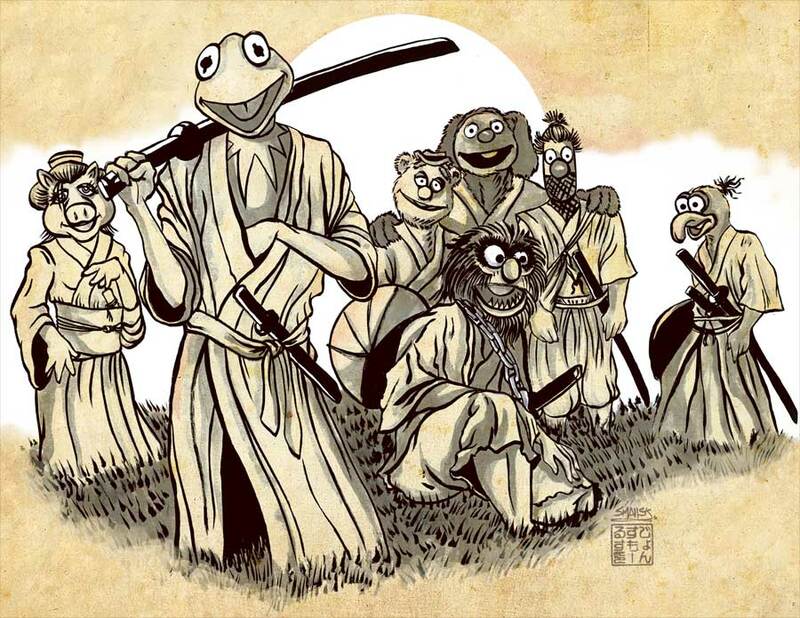 John’s artwork can be found on/in gis, rashguards, shorts, prints, canvas, etc… In our little corner of the world John has worked with Ronin, Shoyoroll, NoGi and Modern Flow to name a few. To Ronin’s credit they recognized the skills and value of bringing a professional artist into the design process (their Samurai gi was in collaboration with Meerkatsu) and continue to offer well designed gis (check out the Legacy gi). Now to the review. Stress points for the jacket and pants are triple stitched with white thread and are consistently even and well done. There was a little overstitching on the collar. 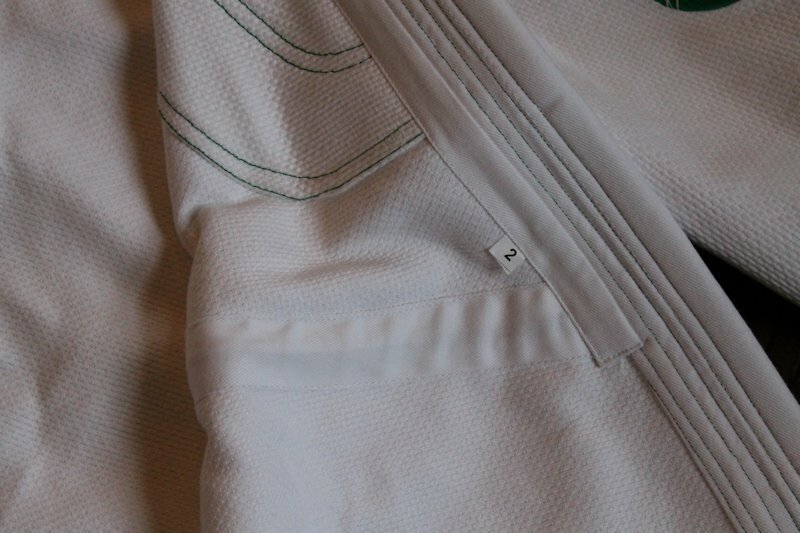 The collar is very thick and stiff, pretty much the same as their Samurai gi. There are reinforcements at the jacket skirt slits, pants slits and armpits. The interior of the cuffs have been covered in cotton tape. The jacket is constructed of 425g pearl weave, is lightweight and comfortable. The exterior of the jacket is very simple, with only 3 pieces of embroidery and a small manufacturer’s identification patch at the base of the lapel. The shoulder embroidery is a 3.75” diameter circle with the face of Statue of Liberty in the center, Ronin Brand and New York are written on the perimeter. The bottom of the gi also has “5 BOROUGH” embroidered in yellow on the outer flap. The interior of the gi has an illustration of the 5 Boroughs separated by the East River and Bays. The pants are constructed of 10oz cotton and the waist has a six belt loops for the cord drawstring. White cloth is used for reinforcement as the side slits. There are only two patches on the pant; both are placed to be unobtrusive. The manufacturer’s logo is on the right upper thigh (1.875” x 3.25”) and 5 Borough patch is on the left outer thigh (2.75” x 9.375”). The only other adornment is “5 BOROUGH” embroidered in yellow just below the left knee reinforcements (which start at mid-thigh and go down to about 8 inches from the cuff). I’ve beaten this thing up for 3 months and it’s going strong. The threading, seams, embroidery and (most surprisingly) the interior artwork have all held up very well and looks the same now as it did when I got it. The fit is good and not overly baggy in the arms. Ideally, the pants would be cut a little tighter. I really like the fact that I can wash and dry it whenever I want so that I can wear the next day. This may sound like a given but when you’re my size it’s hard to find a jacket and pants that you can put in a dryer. Ronin brand went thru the expense of hiring a professional artist, John Smalls, to help with the design process and I appreciate that. Ronin’s service is solid, their gis hold up and they’re releasing new gis on a regular basis. All reasons to support them. While I can appreciate a little bling now and then I really liked the overall subdued aesthetic of this design. 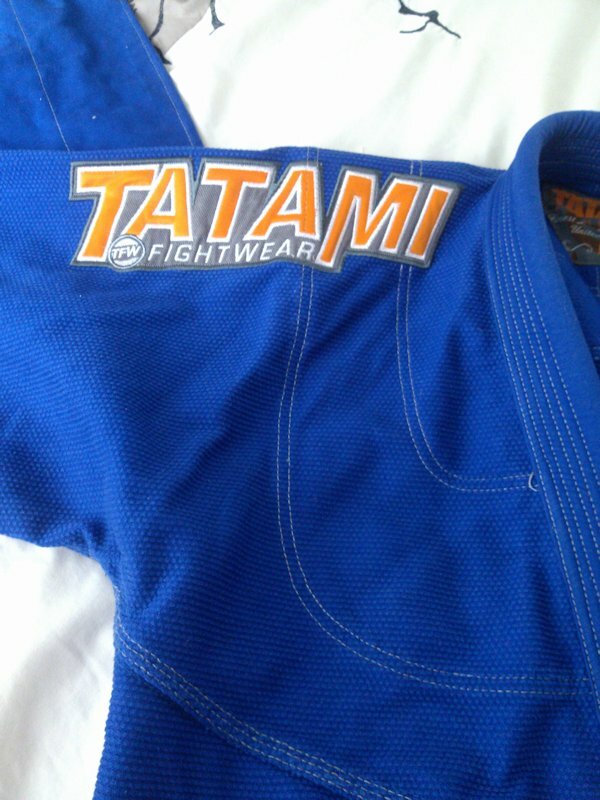 This gi is part of my regular rotation of blue and white gis that I wear every week. Simply put, they did a really good job with the gi and I’m glad have had the chance to review it. It is understated, well built and features commissioned art from a jiu jiteiro artist, John Smalls. Available for $139.95 (white) or $149.95 (blue/black) this gi is competitively priced with other quality gis. For more on Ronin Brand be sure to follow them at their Website and Facebook. You can follow John Smalls at his Website, Facebook, Twitter and Instagram.